With all the trailers popping up over Austin, which ones should you try first? The trailer that usually pops into my head first is Chi'lantro. It's sometimes tricky to locate (you have to check their website schedule), but once you do, you'll be pleasantly surprised by the innovative trailer food. The Koreans have always been known for their delicious BBQ and fermented veggie sides. Who would have thought the two together, wrapped in a tortilla, could be so wonderful? You get a choice of beef, pork, chicken or tofu in your taco, topped with delicious Korean salad, onions, cilantro (and you all know how I feel about cilantro), salsa, and sesame seeds. Trust me, it will be the best $5 meal you can get in Austin. But stick to the beef or pork tacos. The tofu tacos aren't very flavorful. Laura's note: Dude I love the tofu tacos! They are plenty flavorable for my palate. The chili fries are awesome too but very spicy so beware. 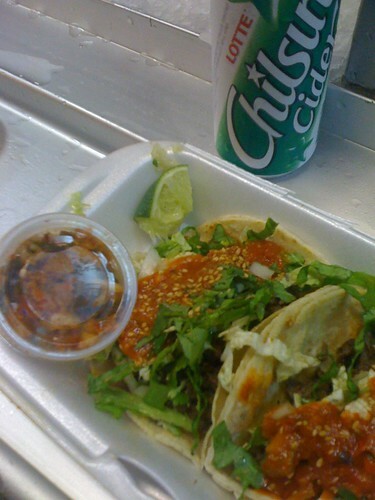 Chi'lantro was a major part of my weeklong SXSW 2010 diet. It's so convenient, cheap and yummy. Korean and Mexican. What a great fusion of two different completely different ethnic culinary traditions. Before you know it, someone will have a goulash waffles or bacon donuts.. Oh wait..